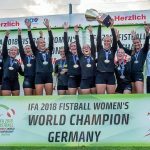 The two top contenders for the title, Brazil and Germany, have emerged as winners of their respective groups in the preliminary round of the IFA Fistball Women’s World Championship in Linz. Brazil scored a 2:0 victory over the Swiss team to secure winning their group in an impressive manner. So far, the Seleção has not lost a single set in the tournament. The second place in the group went to the Swiss team who beat hosts Austria in the last match of the day. New Zealand finished the group stage on place four, ahead of their fellow newcomers from Belgium. In their direct duel, the New Zealanders prevailed against the Belgian team, scoring their first win in a World Championship. “It’s very exciting to have won our first match and we got a lot of good combos which is exciting. It was such a good opportunity and we are looking forward to the next though competition”, said New Zealand’s Melanie Vannoort after the match. Defending champion Germany did not lose a set either, winning their group after a showdown against the Argentinian team who had won its first four matches in the group. Italy finished third, and the newcomers from Serbia and Poland on the fourth and fifth places, respectively. The Polish team won against the Czech Republic and thus scored their first victory at a World Championship. “We started really nervous in the first set and made many mistakes. I’d say it was our worst performance in this tournament. Fortunately, we eventually won the first set and managed to make quick points in the second set. We won 11:4 and it was a great game. We are really looking forward to tomorrow”, said Polish attacker Dominika Frydrych. The IFA Fistball Women’s World Championship continues tomorrow with ten games, featuring the double elimination matches as well as the first two quarter finals.